Digi-Schlock: I, MADMAN (Scream Factory Blu-Ray) – Schlockmania! In the second half of the ’80s, you could read coverage of a horror film in Fangoria and never get the chance to see it in a theater. As the theatrical market got tougher for the independents that often made these films, more and more horror flicks quietly slipped onto home video after a brief theatrical run in a couple of cities. Such was the fate of I, Madman, a film that made the cover of Fangoria but was seen by most ’80s horror fans via VHS or cable. Thankfully, Scream Factory has rescued this video fave for a high-def upgrade and the results give it the nice treatment it never got on the big screen. The transfer for this looks pretty good, with a rich color palette and a nice level of fine detail whether the scene takes place at day or night. Both 2.0 and 5.1 lossless stereo mixes are included. The 5.1 mix was listened to for this review and it’s a subtle affair that adds a little extra dimension to the score and the flashier moments of sound design. A nice little platter of extras has also been assembled for this set. It begins with a commentary track featuring director Tibor Takacs, FX designer/actor Randall William Cook and moderator Robert Galluzzo. It’s a very production-intensive track, with a lot of information about locations and the complexity of incorporating multiple types of special effects. There is also a great tale about Ray Harryhausen visiting Cook’s FX studio to check out the stop-motion effects, complete with Cook doing an amusing impression of Harryhausen. The centerpiece of the extras is a 33-minute making-of featurette entitled “Ripped From The Pages.” Takacs and Cook appear here as well as screenwriter David Chaskin and cast members Clayton Rohner and Stephanie Hodge. It’s a well-paced overview that includes an interesting he said/he said story by Takacs and Cook about how Cook was cast, a nice tribute to leading lady Jenny Wright by Hodge and some heartfelt tributes to the film by all the participants. The end result conveys the love they all feel for this offbeat, imaginative little film. Next up is an 11-minute collection of behind-the-scenes video footage, narrated with dry wit by Cook. It focuses primarily on FX-intensive sequences and allows the FX maestro to explain the complexities of his work, particularly in his detailed descriptions of how the finale had to be staged precisely to incorporate stop motion effects. There are also two trailers: a plot-intensive theatrical spot under the film’s original title of Hardcover and a more rock ’em/shock ’em home video trailer. An animated photo gallery closes the extras out, with lots of behind the scenes shots and concept sketches. Cook narrates this montage with some funny tales of makeup FX rigors. 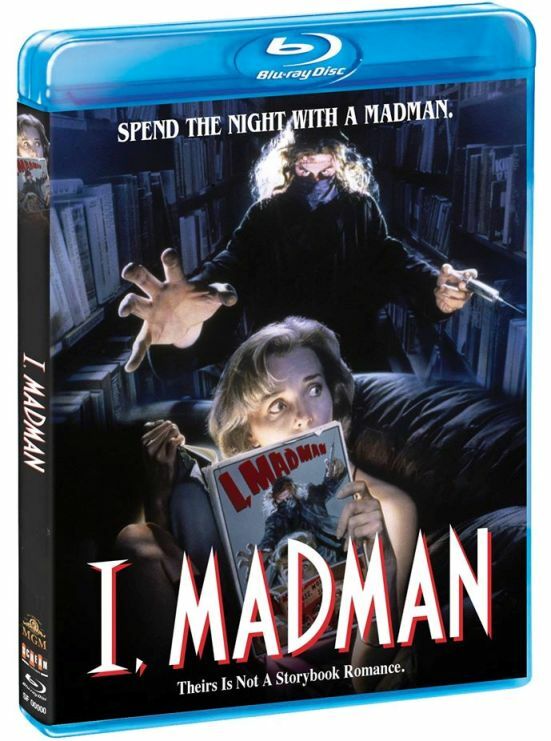 In short, this disc of I, Madman is a nice treat for ’80s horror fans. Until it gets a theatrical revival, this will be the best way to see this overlooked film. 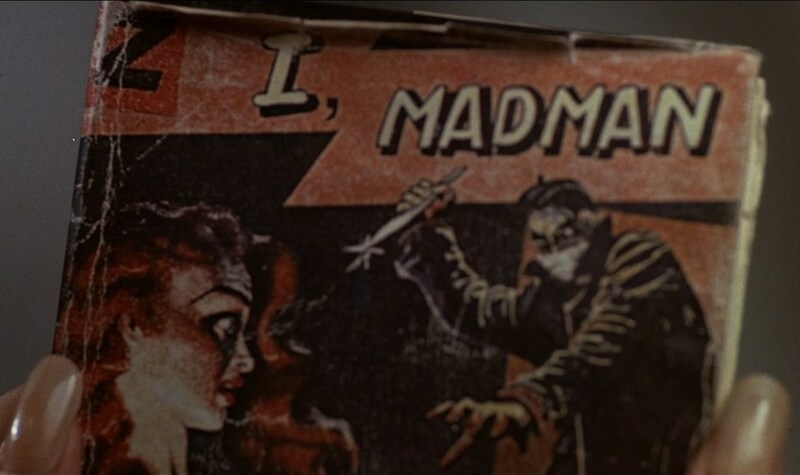 To read Schlockmania’s film review of I, Madman, click here.